When you sign in to Tableau Server or Tableau Online, the first page you see looks similar to the following example. 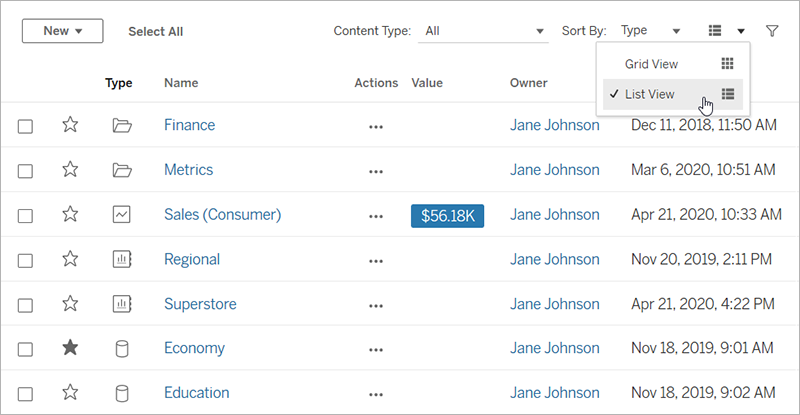 You can explore the content available to you by filtering, sorting, and searching. Your site role and content permissions determine the content that you can see and the options that are available. By default, you will see all Top-level Projects. You can select different content types to see All Projects, Workbooks, Views, Data Sources, or Flows you have access to across the site. Each site on Tableau Server and Tableau Online has a name and an ID. If you have access to multiple sites, you select one when you sign in. After the server name, the URL includes a hash character # and the name of the page or workbook you navigated to. If the URL doesn't include /site, then you’re signed in to the Default site. Once signed in, you can navigate to another site by selecting it from the site menu. Your administrators or project leaders might have created a project hierarchy to organize the content that you work with. In project hierarchies, top-level projects can contain other (nested) projects. Select All Projects. This shows both top-level projects as well as nested projects. Select Top-level Projects and view the content as a list. The Projects column tells you how many nested projects a project contains. Select Top-level Projects or All Projects, click a project, then click a workbook, and finally click a view. Select All Workbooks, click a workbook, and then click a view. Select All Views, and then click a view. 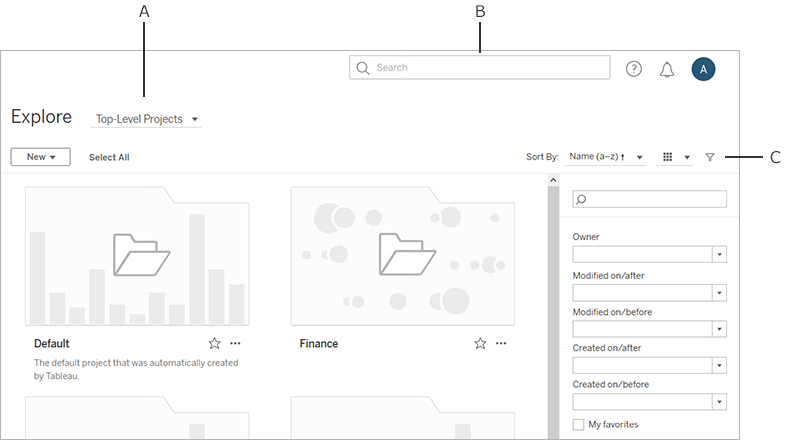 When you open a project, you will see all of the content that project contains on a single page, including any nested projects, workbooks, and data sources. 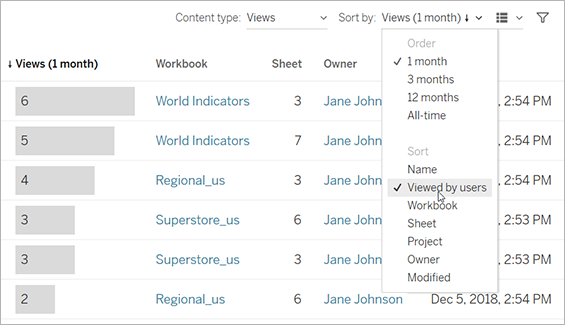 You can filter, sort, and search this content or dig deeper by clicking on a nested project. When you select items of interest, you can change permissions, download the content, and perform a variety of other actions. For more information, see Perform Actions on Web Content. You can display items as a list or as a grid of thumbnails by clicking the View as icons. In grid view, you can hover over thumbnails to see details about the items. By default, you will see all the content types that a project contains. 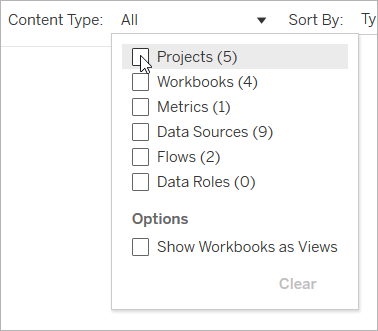 To see only a specific content type, like workbooks, click the Content type drop-down menu and de-select the content types you don't want to see. 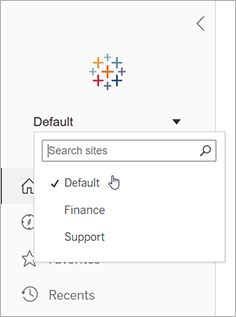 To sort items, click the Sort by drop-down menu. You can sort by characteristics such as name, owner, number of views, and creation date. This example shows the sort options for number of page views. You can also sort a list by clicking the column heading. An arrow indicates the order: ascending (up arrow) or descending (down arrow). You can sort data sources by the number of related page views or workbooks, or by last extract refresh or modified dates. (Modified dates show when a user last published edits to the data source.) You can also sort based on server alerts, highlighting data sources with extract refresh or latency issues. To see data source type and authentication details, from the Show as menu, click Connections. When you open a view, the options available to you in the toolbar vary depending on the site configuration and your permissions. 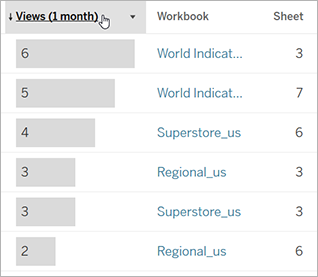 When a workbook is published from Tableau Desktop using the Show Sheets as Tabs option, you can see each sheet by clicking the tabs at the top of the page. 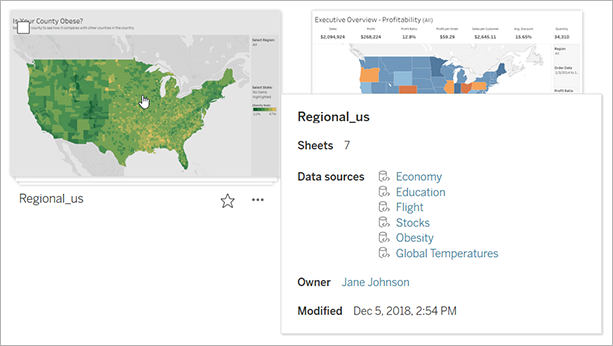 For more information about working with views, see Edit Tableau Views on the Web.